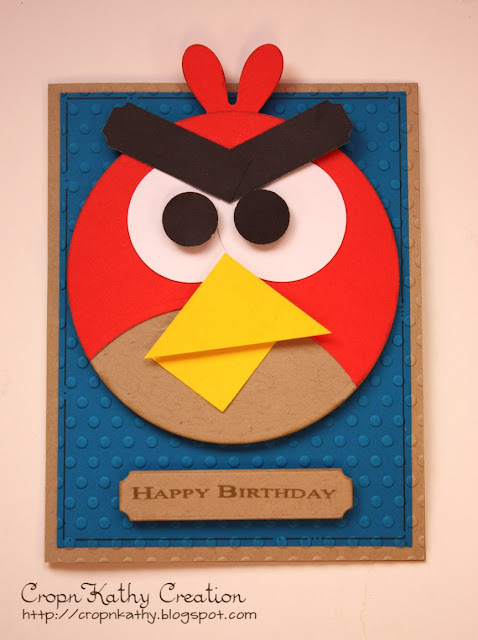 CROPNKATHY: Angry Bird Birthday Card! Happy Birthday goes out to my wonderful son Adam who turns 12 tomorrow! Adam just loves Angry Birds and when I saw this great card on Pinterest, I knew just what to make for him. Imagine my delight when I found it included this great video by Dawns Stamping Studio. Thank you Dawn for such awesome instructions! I had to improvise a little as I didn't have all the same products, but I'm pleased with the result. Adam, sweetie, I wish you a day filled with sunshine, love and laughter! Punches: Mary Uchida square punch 1" and 1.5"; circle 5/8" and 1 3/8"
My Mums Craft Shop - Kraft It! Thanks for visiting! Have a happy scrampy day! Your inspiration is rockin'. I am totally digging all of these circles. Wonderful angry bird creation. Found you on Make It Monday. Great inspiration and all of the circles are way to cool. Thanks for sharing your wonderful creation with us at 4 Crafty Chicks. What a fun great card you have made for your son. Really great. Wish him the best birthday ever. Came to see you via MIM. He certainly looks angry, you've done a fab job on him. Happy birthday to your son. Great card, thanks for joining us at MMCS. What an awesome card. I love the embossed dots behind that great angry bird. Oh so cute! My grandson would flip over this, he loves angry birds!